Chief Polin’s ominous remark in the headline above (spoken to the governor of Massachusetts in a plea to avoid further war in the Sebago region) reads like a metaphor for the surge of English colonists that effectively blocked the way of life Native Americans had known for millennia. As noted in the first installment of this series (The Windham Eagle – Jan. 19, 2018), the decades between English explorer Christopher Levett’s warm greeting by the local Wabanaki people at the Presumpscot in 1623 and Chief Polin’s list of grievances expressed to Governor Belcher in 1739, were marked by the failure to come to terms over cultural differences. Levett’s successors in the area viewed the land as an endless supply of natural resources for the European and other world markets: Fish, including anadromous species that spawned in the Presumpscot; trees, exploited without regard for conservation, were taken for lumber and firewood - this included the ancient and stately (200 to 300 foot tall) white pine destined to be masts for British Navy ships; and dubious trade practices with the natives would result in the over-harvesting of pelts, especially beaver pelts. In exchange for the riches, the Indian (who had no notion of the concept of money) would often receive trinkets or liquor. And still forged in their memory, was the catastrophic European diseases brought by the white traders and their barter; sicknesses to which the Northeast inhabitants had no natural immunity. The nature of the pandemics is unknown, however the symptoms discussed by missionaries and recorded in other primary-source materials, indicate the illnesses included smallpox, diphtheria and measles. Referred to as the “Great Dying” (1617-1619) many tribes were nearly wiped out with up to a 90 percent death rate. Following the tragic times, the land affected by the horrific epidemics became known as Mawooshen. In the resulting process, known as diaspora, the Wabanaki nation (a confederacy of four major tribes) organized into smaller, semi-nomadic bands. These loosely formed families were usually identified by the territory they occupied. Formed over a century later, Polin’s family of several dozen individuals became known as the “Presumpscotts”; although with the change of seasons or in times of danger, they were known to have occupied land on the Saco River near Fryeburg (Pigwacket) and along the St. Francis River in Quebec. 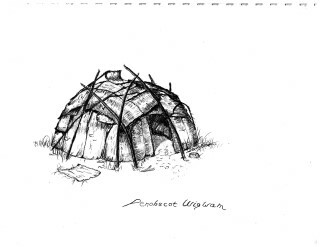 Thus, says Mawooshen researcher and anthropologist Alvin Morrison, Polin might properly be labeled as Presumpscot, Pigwacket or Arosagunacook (St. Francis) because he reigned in all three locations. We’ll examine this issue more closely in a future installment of The Historical Record. Such practices by the newcomers from Massachusetts in the newly established township of New Marblehead (later Windham) were diametrically opposed to the Indian worldview. Chief Polin’s group of natives and their ancestors who thrived along the Presumpscot, from the White Mountains to Casco Bay, is an example of the small bands which often consisted of members of many different tribes, functioning within a single watershed system. They hunted the uplands during winter, then settled along the Presumpscot near the ocean. There they fished, harvesting several species during the spring spawning run, including salmon and alewives. They planted beans, corn and squash. And, notes one local historian, the coast also furnished relief from incessant mosquitoes and other flying insects. Depleted crop lands were re-established into open meadows, accommodating and nourishing various waterfowl and small game animals. In all areas of sustenance - whether crops, fish, fur or fowl, the Native people recognized the rise and fall of food sources and that the supply was finite; they knew it had to be replenished through the frugal taking and/or leaving to maintain a reserve in harmony with the seasonal cycles. The Native Americans did not operate through formal scientific thought; the term “ecology” was unknown to them. But their traditional habits of interdependence had formed from observation and experience over thousands of years. Implicit was the lesson that individual actions could have disastrous effects on the group. Also unknown was the concept of land ownership. To them, all humans utilized and respected the endowment of all the land. And so, it was viewed as incomprehensible that newly arrived settlers would lay exclusive claim to large tracts of property to do with as they pleased and exclude others. Newcomers were awarded traditional Wabanaki lands by the Massachusetts Colony or by the British Crown. The land titles did, however, acknowledge the Indians’ right of inheritance and pledged to respect their rights and traditions through shared co-habitation. The settlers, however, viewed the agreements as exclusive title. Soon dams dotted the Presumpscot, blocking spawning grounds and destroying the natural flowage for the next 200 years and beyond. He also called for a halt to further expansion and construction of forts, that “. . . there be a cessation of settling anymore and stopping now as far as they are settled.” On several occasions, the English Colonial Government granted all Polin’s pleas, but the promises were ignored on the Maine frontier. Several Anglo-Wabanaki wars had been fought since the late 1600s over similar issues. The latest, known as the French and Indian Wars, would settle the disputes once and for all. Desperate to save his peoples’ livelihood at Sebagoland, Polin moved his band to St. Francis, Quebec for safety and returned to take up arms against the English Colonists. Numerous conflicts raged along the northeast coast from the 1740s to 1763. English farmers suffered harassment and kidnappings – dams were set afire. Residents of the young township barricaded their log homes – many lived for several years in the nearby fort. It’s a matter of historical record that, on many occasions, the Wabanaki people strove to indoctrinate the newcomers into their groups and way of life – to no avail. In spirit, the Europeans and the Native Americans were foreign cousins; in practice, the pairing became like oil and water. In our next installment, the war in Sebagoland is settled by a memorable battle at New Marblehead. Early Windham historians and an eminent 19th century poet have memorialized the story, but at least one modern anthropologist cites a lack of evidence with certain details.